1. 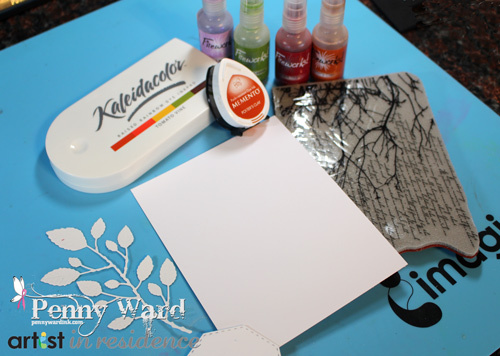 Cut White cardstock 4.25 x 11 inches, fold in half to make a base card. 2. Cut Black cardstock 4.25 x 5.50 inches, adhere to base card. 3. Cut White cardstock 4 x 5.50 inches. Spritz with Fireworks Bamboo Leaves. 4. 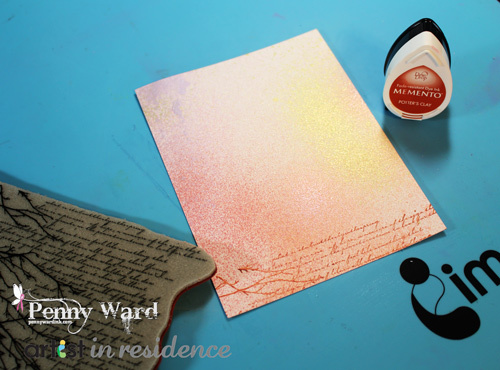 Spritz around the card front with Fireworks Potter’s Clay, Rhubarb Stalk and Lulu Lavender. 5. Stamp just the writing portion of the stamp along the bottom and left side of card front with Memento Potter’s Clay ink. 6. 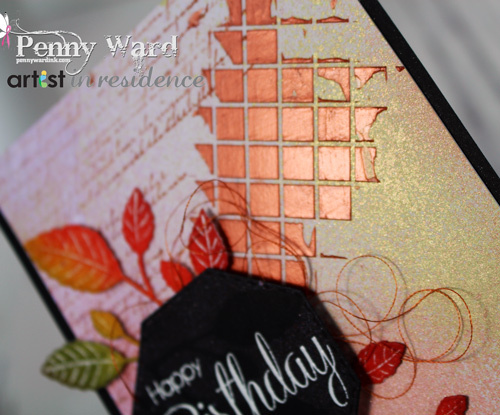 With a stencil taped over card front, apply Creative Medium Copper with a Palette Knife. 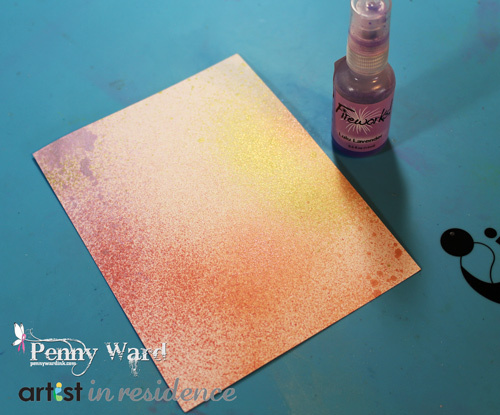 Let dry, then adhere to base card. 7. Die cut leaves from White cardstock. 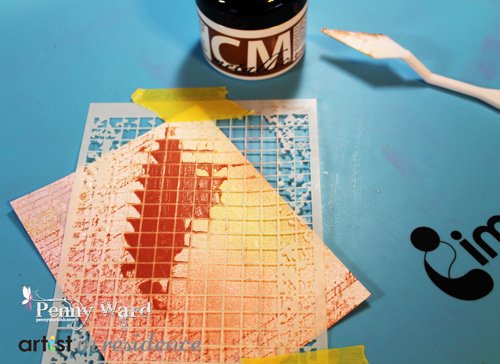 Using a brayer, apply Kaleidacolor Tomato Vine. 8. 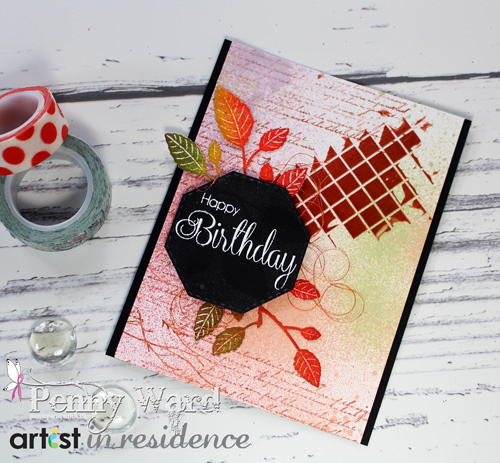 Die cut small Octagon from Black cardstock, stamp sentiment with VersaMark ink and heat set White embossing powder. 9. 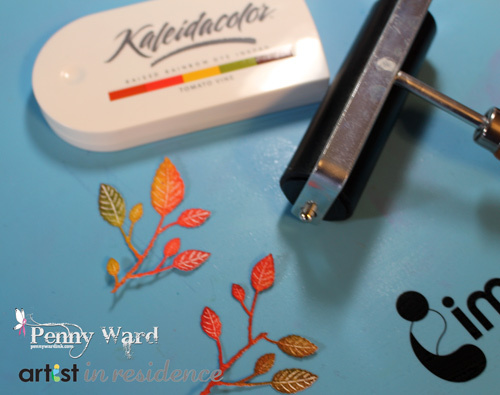 Assemble card by first adding a long length of Copper thread. 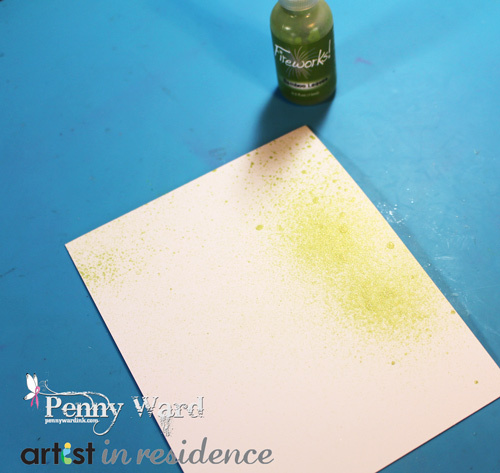 Adhere leaves with foam adhesive and sentiment panel has two layers of foam adhesive.